A historic preservation student's chronicling of current issues and research. I recently came across this article from the Washington Business Journal on Facebook, and my interest was immediately piqued. 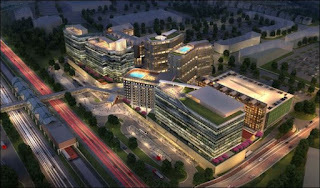 A new "smart city" project will begin in Ashburn, the first of its kind in the area, and will be called the Gramercy District. I began to wonder what kind of impact this would have on the area that I know to be so full of natural and cultural resources. Fortunately, Loudoun has long taken pride in its resources and does well to preserve them. They have a Green Infrastructure plan in place to guide all land development and redevelopment in the county. Not a lot is known about the American Indian tribes who resided on the land before European colonists settled in the area. The location where Gramercy District is planned to be built could very well hold many significant archaeological resources, not to mention the historical landscape, as well as its diverse ecology. Smart cities are certainly an asset to their communities and may prove to be an economic boost to the surrounding area. Gramercy District plans to be right next to the Ashburn Metro Station Plaza, the final stop on the Silver Line of the DC Metrorail system; thousands of people will have to pass through it every day. After the district is built, it's feasible to assume more development will spring up around it such as in Brambleton, another nearby community. There is a fine balance between preservation and progress.As preservationists, we instinctively want to protect natural, ecological, and heritage resources, but we can't be so stringent as to impede positive progress. The residents of Loudoun County are lucky to have a government that values its resources the way it does. What's your opinion? I'd like to know what you think about the preservation vs. progress debate. I found this article shared on Facebook and it was very interesting. I thought I'd share it and get your take. Lots of thoughts go through my head about the future of digital history, and what that will mean for memes like the "Ermahgerd" girl. The repository for memes, KnowYourMeme, and other sites like it (perhaps even giphy), will be a great source of information to those studying current Internet culture. Trends are so fleeting, however, that this may be a blip on the radar to future historians. I've created a blogger site for what I've dubbed the Digges Valley Farm Ruins. Check it out! This is a work in progress - as I continue my research for Historic Archaeology I hope to add a lot more to the site. There is a solid foundation now with a lot of great information on the ruins and the people who owned the land. Feel free to comment with suggestions, ideas, or questions! When I think of digital history I often wonder how on earth historians are going to muck through all the insurmountable stuff that's on the internet. "Stuff" is the only way I can describe the innumerable Facebook posts, instagram photos, tweets, snaps, screenshots, Periscopes (something I only learned about the other day), and any other debris and shrapnel of the battlefield of social media. That doesn't even include emails, internet ads, YouTube videos, or blog posts. What's important? Who decides? How will these things be saved? Research will have to completely change if the topic covers anything to do with the Internet. There will have to be vast databases to hold all of the information. With the presence of databases must come a system of organization and classification. Hopefully search engines will be much more effective in the future to aid researchers. One thing that concerns me about the future of digital history is how things will be saved. It may be easier to trace the Facebook posts and Tweets of important political figures, such as during this year's presidential race, but what of the average person? Diaries and letters exist from past generations, but what will be left from the Web 2.0 era? Too easily one can lose that article they remember reading, or that funny picture they once saw (don't even get me started on attributing credit to authors on the internet, it's near impossible in most cases). People change email addresses, delete old emails for storage space, and hyperlinks get broken as pages are moved or changed to make room for the new. Many times a conscious effort has to be made in order to save something online, and there must be a designated place to save it in its original form. Will mobile versions of websites also be saved? And phone apps? One thing is for certain: the future of digital history will be very interesting as scholars try their hardest to keep up with the ever-evolving cybersphere. Yesterday I uploaded five photos to the Northern Virginia Digital History Archive. I wanted to show a mixture some of the changes and developments in Northern Virginia I've seen as well as how our history has been influenced by these changes, and how we coexist with our history. The site was very easy to use. It took me more time figuring out which pictures I wanted to upload than to actually submit them to the archives! One of the first photos I submitted was one I located online while doing research for my project. It was through Google Earth, and located in an area I'm almost positive belonged to the Grubb family. 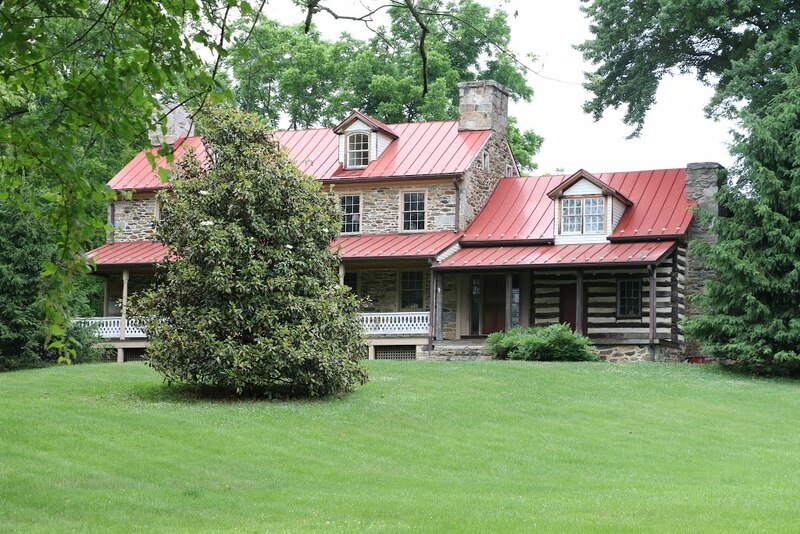 It's a log cabin on Ash George Road in Loudoun County, and may have been built by Benjamin Grubb in 1847. It is still inhabited and, as you can see from the photo, has been maintained and updated over the years. I would sincerely like to do more research on this dwelling when I have the time. 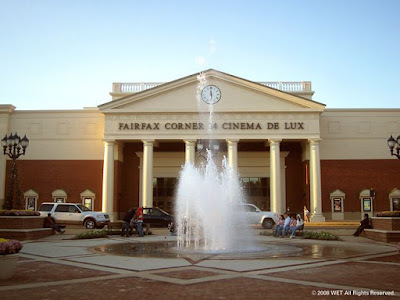 Another photo I submitted was taken at the water feature in Fairfax Corner, an open air shopping center located in Fairfax County near Fair Oaks Mall. 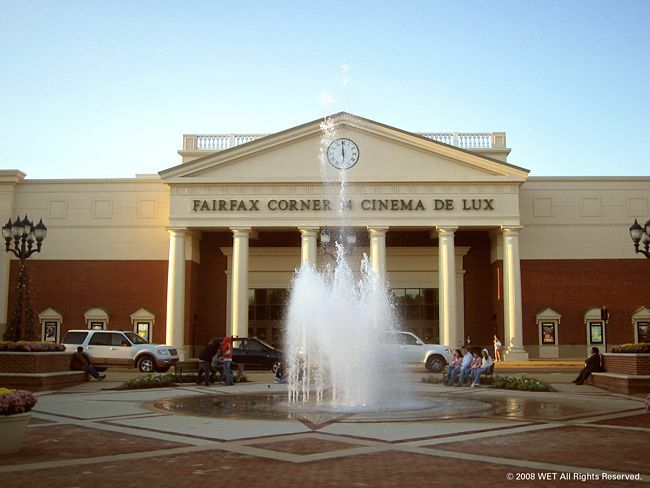 Behind the water feature is the movie theater, designed in a modern neoclassical style. In the warmer months you can see lots of children playing in the water feature or riding the train around the center plaza. There is often family friendly live entertainment on the weekends. This photo reminded me of how historic architecture styles are still used to generate nostalgia or create a certain ambiance. 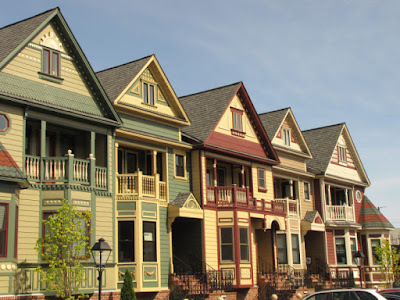 You can see this in the new row houses that were built in Historic Occoquan right on the waterfront. The townhomes are completely modern on the inside, but ornate and Victorian on the outside. After uploading pictures of the new, I wanted to go back to the old. While searching for inspiration I came upon the Stone House at Manassas Battlefield Park. I wanted to show just how close the structure is to the main highway and new traffic light and crosswalk that has been put in within the last few years, reminiscent of the U.S. Capitol gatehouses in Washington, D.C., in the way that the city has grown and developed around them. There is always a steady stream of traffic right in front of the house at the intersection of Highway 29 and Route 234 in Manassas. 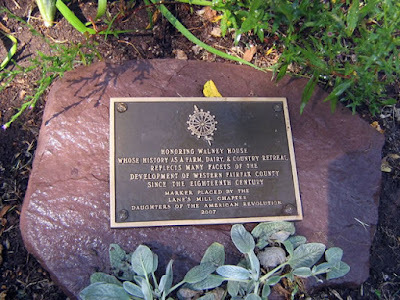 Finally, I uploaded a photo of a historic marker located at the Walney Visitor Center in Chantilly, in Ellanor C. Lawrence Park. This marker was placed there in 2007 by a local chapter of the Daughters of the American Revolution. As much as Northern Virginia has grown and developed in the past few decades, it's encouraging to see people remembering the past. What made this assignment difficult was that none of these photos were taken by me. I tried to find a source for each photo in order to give credit, but wasn't always successful. I would have much rather used my own personal photos to submit, but was unable to at the time. I have been busy at work researching the "Grubb farm ruins" in Loudoun County, Virginia. Fortunately the Thomas Balch Library in Leesburg is a treasure trove of information, as well as help. I've looked through the archives of the Library of Virginia, as well, to study chancery records of one of the land owners in the 1850s. Aerial photographs and old maps have been wonderful in locating the property before I was ever able to set foot on it. Perhaps the most interesting, though, is that I have yet to be able to connect the name Grubb to the property. So far, I've been able to trace the ownership of the parcel of land in Digges Valley back to it's original sale from Lord Fairfax to a Mr. George Atwood in 1737, when the land was still part of Prince William County (Loudoun County formed in 1757 out of Fairfax, which formed out of Prince William County in 1742). 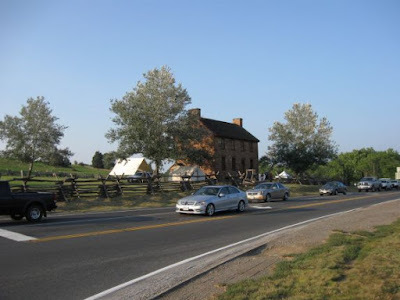 The Grubb family was a large family in Loudoun County that originally came to the colonies from England in the mid-1600s and settled in Delaware. The founding family member's grandson, William Grubb, came to the area in the 1760s. There is a property in present day West Virginia, south of Charles Town, that has been nominated for the National Register of Historic Places and called the William Grubb House. Another branch of the family settled there when William came to present day Loudoun. His progeny prospered during the mid-1800s and were divided by the politics of the Civil War. At the moment, I'm continuing my research on how the land passed from owner to owner, what the land was used for (agricultural censuses), and if I can find any information on when the structures were built and by whom. I would love to get out to the site in order to take pictures if I'm able to get permission from the current land owner. If I'm not able to reach him before the project is due, another student who did a field study of the site this past summer has kindly said she will send me photos that I can use. What is and isn't real? In digital history the reality of subjects is often overlooked. What is real? What is not real? What makes something real versus not-real? When I was a little girl I was in love with the American Girl Dolls. Samantha was a character who grew up in 1904, and Felicity grew up in 1774. I was fascinated by the stories surrounding Samantha and Felicity, every one filled with bits of historical truth about the time periods they lived in. What made it real for me was applying things I learned from those books to real life. My parents gave me a Samantha Cook Book with recipes from 1904. I made these special biscuits all by myself following the recipe, and my dad even got me an old fashioned flour sifter to use to make it feel a bit more authentic. In one Felicity book I remembered her entertaining her younger siblings by mixing a bit of soap with water in a shell and using a reed to blow bubbles. I recreated this using a bowl, a bit of dish detergent, and a straw. I was able to use my imagination to put myself into Samantha and Felicity's shoes. I believe that's what can make history real for some people. On the other hand, look at how popular Colonial Williamsburg and Historic Jamestown are. Visitors are able to reconnect with the past by seeing the clothes and tools, smelling the animals and cooking fires, hearing the interpreters talk about their daily lives, and touching the recreated village. At the Frontier Culture Museum in Staunton, Virginia, visitors can walk through actual dwellings that were taken apart in their original locations in Europe and reassembled on site to show the change in building styles in the Shenandoah Valley and how they were influenced by the immigrants' cultures. As a visitor you see the woodwork, the brick ovens, the narrow staircases, the plaster walls, and many historically accurate reproduction (or period) furniture pieces. Even though a lot of these things are recreations of what it would have been like in the 17th and 18th centuries, and not actually the historic object itself, does that make it any less real? If a little girl put on a costume styled to look just like her favorite American Girl doll's garb, would that not make it real for her? One part of digital history that is possibly the most difficult when speaking of what is real and not real is written documents. Paper, over time, becomes very fragile and needs to be preserved - therefore, not many people have the opportunity to hold very old original documents, especially not with their bare hands. It can be very difficult to fully grasp a concept or put it into context if you cannot see what it would have originally looked like on paper. I was recently looking up old land deeds and came across many abstracts and indexes for these historic records. I found some transcripts of deeds as well. It was very difficult for me to fully understand the age of what I was reading (from 1619! 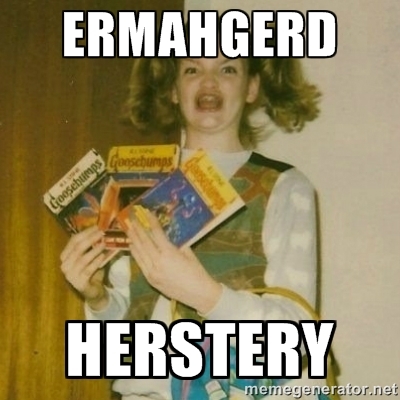 ), even with the old spellings and language. Perhaps if I were able to see a facsimile or scanned digital copy of the document, then I could have seen the handwriting of the clerk, and understood it in a deeper way. I believe there are many levels of what can be real and not-real, and it could differ from person to person. For some, simply reading a transcript could be enough to make something real in their minds. Others may need a reproduction or image of the actual object to make the connection. There is a site called Digital Karnak that has computer generated images of the hieroglyphics and layout of the sacred site in a way that a visitor can explore an area that is almost non-existent anymore. When I looked at just one part of the temple wall, I was amazed at how many hieroglyphs would have been in one area, and how the grouping could tell of special ceremonies and rituals. Seeing this digital representation, being able to click and zoom in on the glyphs, made it more real to me. While there are some disadvantages to having a simple *.pdf transcript of a historical document, there are many other ways digital technology has of making something more "real." Digital history must remember to always put things into context as much as possible and within whatever limits the current digital project has. I'm a student and lover of historic preservation and digital history. I like sharing preservation news and information about local historic sites. This will primarily be used to blog about the classes I'm taking now and the projects I'll be working on: Introduction to Digital History and Historic Archaeology.